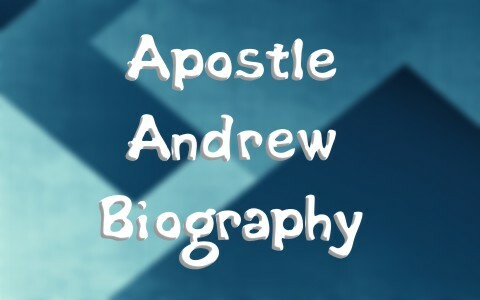 What do we know about the Apostle Andrew? What is it about this man’s life and death that is important for us to know about? Both Andrew and Peter left everything behind to follow Jesus to become “fishers of men.” This is astounding if you think about it because they left their lifelong job security, the only thing they had ever known, everything that was familiar to them, and obviously they had to leave their family behind too, all walking away at Jesus’ invitation. The words “Immediately they left the boat and their father and followed him” reveal to us the true nature of this “all” that they left to follow Him. They forsook both their living and their father and family. What their father must have felt about this is not stated but one wonders if Andrew and Peter’s father tried to talk them both out of it and when he couldn’t, must have been dumbfounded. Andrew was apparently a disciple of John the Baptist before he was a disciple of Jesus. We read of an encounter between Andrew, John and Jesus in John 1:40-42 “Andrew, Simon Peter’s brother, was one of the two who heard what John had said and who had followed Jesus. The first thing Andrew did was to find his brother Simon and tell him, “We have found the Messiah” (that is, the Christ). And he brought him to Jesus.” What I like about Andrew’s nature was that he was always bringing people to Christ. Perhaps he had been doing the same thing for John the Baptist. It wouldn’t be surprising if he did given the fact that he was bringing others to Jesus. Maybe that’s because Andrew immediately recognized Jesus as the fulfillment of the long-prophesied Messiah (John 1:41). Andrew and Philipp once even brought some Greeks to meet Jesus (John 12:22) so the thing that impresses me most about Andrew is that he forsook everything and everyone to follow Jesus and then was determined to bring others to Christ. How much am I like that or how far do I fall short of that willingness to forsake all and bring others to Christ? From what we know from church history and tradition, Andrew kept bringing people to Christ, even after Jesus’ death. He never seemed to care about putting his own life at risk. It is believed that he was martyred by crucifixion in the city of Patras which was on the northern coast of Peloponnese which was in Greece. Given the fact that he was likely crucified there, he must have, like many of the other apostles, went well beyond Judea to bring the gospel into all the world as Christ had commanded (Matt 28:19-20). Church historian Eusebuis wrote that he may have brought the gospel to as far away as Kiev which is now part of Ukraine. It’s interesting that he was crucified like Christ but in the pattern or shape of an “X” which was often a Christian symbol and is now known as St. Andrew’s cross because it was said that Andrew, like his brother Peter, considered himself unworthy of being crucified in the same manner as Christ was. He was crucified close to 70 AD. If Andrew’s life is an example to us, let it be that like he did, we need to be bringing people to Christ and to go into all the world, even if it’s our next door neighbor. He forsook everything to follow Christ, including his family, his job security, and even his nation at the latter part of his life. How often have we told others, “We have found the Messiah” (that is, the Christ)” (John 1:42)? Speaking for myself, I can say, surely not enough times. Andrew is a great example for all of us. Thank you for bringing him to our attention. I am always a bit torn about going in to the world to bring people to Christ. As a former non-believer, I remember not having fond thoughts of evangelists. However, what if you are there right at the moment when they are called to become a believer? That would be awesome! I use a less invasive form of evangelism. I wear a wooden cross as an outward symbol to people about my beliefs. I then live my life as best as I can, as a Christ follower. I hope that through my actions and/or words, someone will ask me about my beliefs. Then I will have a chance to tell them the Good News. So far, no success. But I have not been at it for too long. As a silent witness, I also hope to plant some seeds by my actions or words, even if I don’t see them sprout. Thank you for teaching us about Andrew! I know what you are saying my brother. For so many years I was living the “great omission” rather than the Great Commission and I pray for the Spirit to prompt when to and when not to say something about people’s need for Christ. I err on the side of saying something because for so long it nothing at all and I also pray for divine appointments and He has never disappointed me in this. Andrew is my oldest (now grown) son’s name and I love him dearly and now for you too my brother Jim. I see you have a tender heart and a humble spirit for which the world is in dire need of, besides we could use a few more Barnabas’ types like you. It has been my hope and prayer that the Lord has been satisfied with the way I have been telling others about Him, mainly by means of things I do often. Over the past couple years I have been carrying a hiking stick in the shape of a serpent, and carved a human foot on top for my grip. Other hikers who express interest in it ask me about it, and I tell them its meaning..the promise recalled by Paul in his epistle to the Romans, the 16th chapter, 20th verse. I have never been what one would call a door to door presenter of the gospel. Previous post: What Were The Epistles In The Bible? What Does Epistle Mean? Next post: Why Did Jesus Say Peter Was The Rock On Which The Church Would Be Built?